I've started three different posts in the past few months but have yet to finish any of them. I'm more into quality than quantity. There's a reason they are still unfinished. However, there have been some other people who actually get paid to write (or film) that have written (or filmed) about the ranch and/or our passion for grasslands in the past year or so. Thorstenson Gelbvieh & Angus has sold us a lot of bulls over the years. Wendy wrote this article to include in their 2013 sale flyer. This video was made by Day's Edge Productions for the World Wildlife Fund's conservation work in the Northern Great Plains. Lura Roti writes articles for South Dakota State University's website and newsletters. There are two more articles in the works, unless the editors decide it's too much work making us sound intelligent. We've been interviewed by Successful Farming and The American Prospect in the past few months. I'll post links if/when they publish the articles. Anyone who has had kids can attest to the dramatic increase in conversation pertaining to bowel movements compared to before having kids. Frequency, consistency, odor, amount, the diaper's effectiveness at containment…there's a lot to discuss. 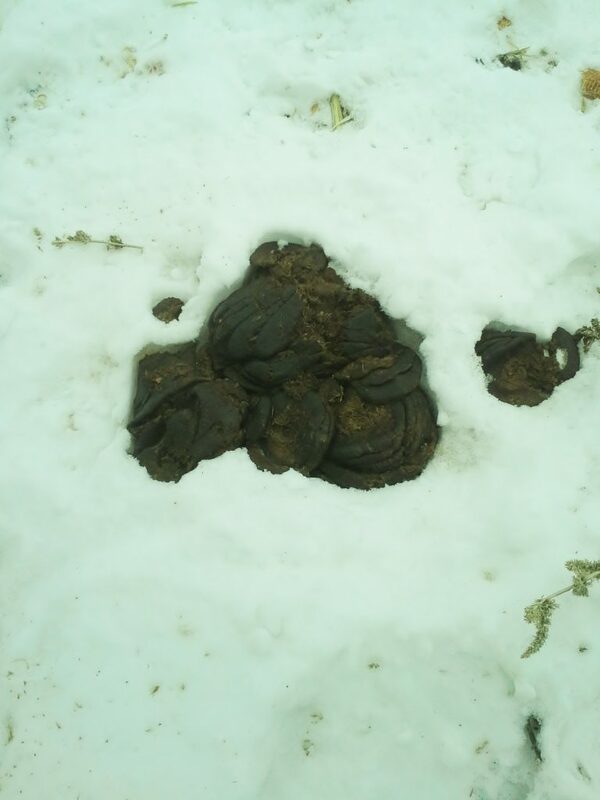 While it isn't a common source of discussion, as a cattleman I pay attention to poop as well. Just as with little kids, I can make management decisions based on what's coming out the south end of the cows. 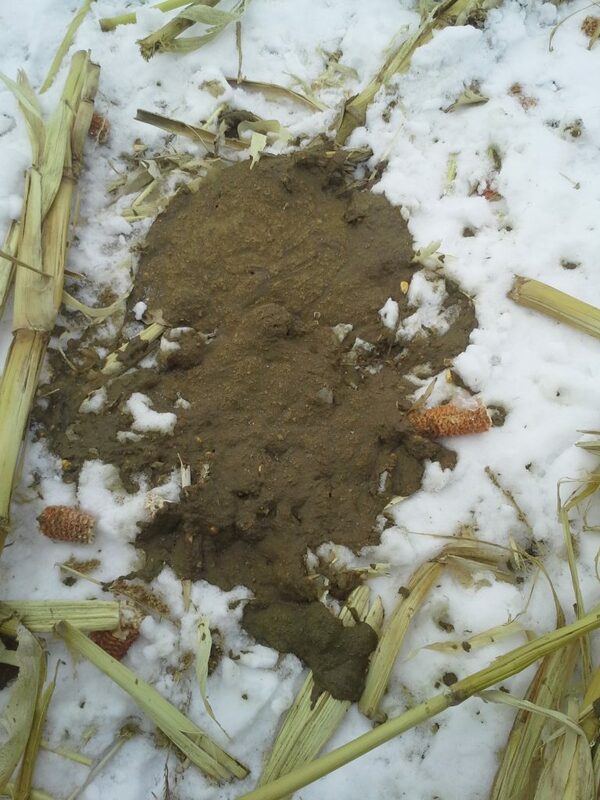 During the winter, our cows are often grazing corn stalks. After the grain is harvested, there is still a lot of feed value out in the field. There are always a few ears of corn that are missed by the combine. That usually doesn't amount to much though. It's the husks and leaves that make up the majority of the fodder. The cows always eat the best stuff first. To a cow, "best" means "most nutritious". If my cows are in a pasture for a week, their diet from Sunday through Wednesday will be more nutritious than from Thursday through Saturday. One way to judge the quality of the diet is by looking at their poop. We'll call them "dung pats", which seems more adult-like. Remember, cows have a four-chambered stomach, specially made to digest forage. When a cow's diet is low in protein, they can't digest forage as well. Protein actually doesn't feed the cow – it feeds the microbes in the cow's rumen (one of the four stomach chambers). The microbes are what actually break down the carbohydrates in the forages so the cow can get energy out of it. Too little protein means fewer microbes, which leads to poor digestion and therefore less energy. The "stacked cookie" look is a dead giveaway. You can also see some plant fibers in the pat. The lower the protein, the longer the fibers are. Now, don't get too concerned. This cow isn't starving or malnourished. She is probably losing a little bit of weight though. I wouldn't want to keep her on this level of nutrition for too long, especially if she is in her last trimester of pregnancy. Having too much protien isn't great either. Remember what the cows are eating? Dry, mature plant material. Not real high in protein. Early in the winter, when the cow is in mid-gestation, her nutrient requirements aren't very high. The corn husks and leaves will meet her energy and protein requirements without much, if any, added protein. However, as winter wears on and her fetus keeps growing, her nutrient requirements ramp up. Additionally, the plant material weathers and quality slowly declines. The energy is still there, the cow (actually her rumen microbes) just needs a little more protein to capture it. There are several ways to supplement protein. Alfalfa hay, ethanol byproducts (aka distillers grains), and commercial feeds are common in our area. Whatever it is, it costs money. Feeding more protein than is necessary increases costs without any real benefits. The dung pat below came from a cow who has more than enough dietary protein. Notice the "splat" effect. "Splat" isn't what we're going for. It's the cow-equivalent of a blowout diaper. 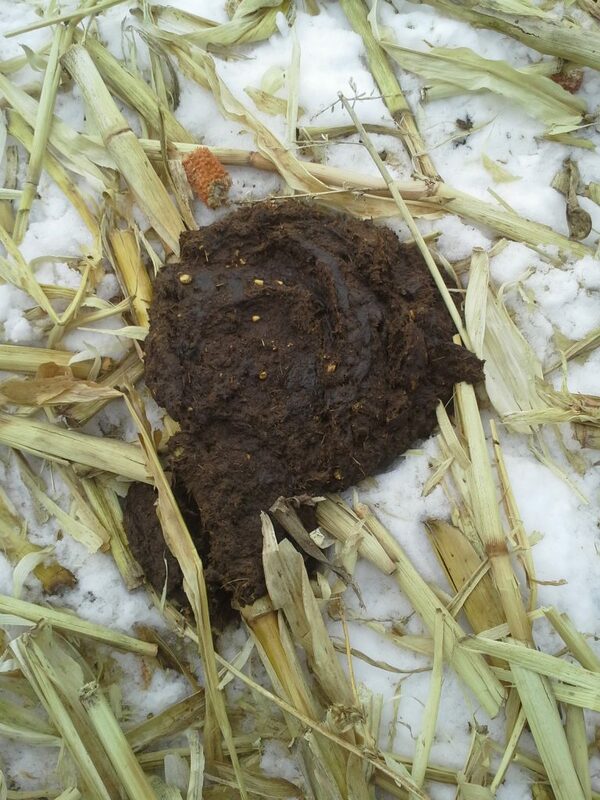 This dung pat was dropped two days after being turned onto fresh cornstalks. I'm not too worried about it though, since it was early in the graze period and there weren't very many that looked like this. If there was a high incidence of "splat" in the herd, I'd back off the protein supplement until they started looking more like the next photo. This cow is getting about the right amount of protein. No cookies, no splat. More of a soft "plop" effect. You can still see some fibers, but they are shorter than in the first photo. A few corn kernels in the mix tells me she's finding some dropped ears under the snow, which provides a little extra energy. Too much corn isn't good though, as the starches in corn change the pH in the rumen, which kills off the microbes that digest the forages. Too much energy for too long also can lead to excessive hoof growth, which makes the cow lame. I don't have a numerical threshold of kernels-per-poop-pile, but this looks about right. All three of these pictures were taken in the same field. How is that, you say? All three cows have access to the same forage, so why the difference? Grazing is a skill. Some cows are better at finding the good stuff than others. Maybe the first cow just doesn't have as good a digestive system as the others. Maybe the second one went on a late-night protein supplement binge. I just go on the average of the field when I'm poop-checking. We're about 60 days from calving season, so these girls are needing higher levels of nutrition as the days go by. I'm paying close attention to their dung pats to make sure they are maintaining or gaining weight from here until the grass greens up. I do that by supplementing protein as necessary, but also by moving them to fresh cornstalks sooner. What I used to graze in 7 days, I might now only graze for 4 or 5 days before moving on. I guess sometimes BS is something that needs to be taken seriously. My mother-in-law loves raising poultry. Come spring, between scouting the chicks for sale at Running’s and setting clucks, it’s nearly an addiction. Every spring since we’ve been married (going on 38 years) she’s had baby chicks and/or ducks corralled in a paper box someplace in her house. One of the nice things about somebody in the family having chickens is fresh eggs and old hens. Nothing makes better chicken soup than an old hen. Last fall, I stewed four of them with carrots, celery, onions, a couple of bay leaves, some whole allspice and peppercorns and a handful of fresh parsley. I poured off the broth and canned it. The meat I diced and froze in pint size bags. Thaw a bag of chicken, cook some noodles and add a quart of broth and you have nearly instant comfort food on a cold night. Lord knows we’ve had plenty of them lately. This cook tires of making the same old all winter long. The following recipe is spicier than noodle soup, but is still definitely comfort food. It’s been in my “to try” folder for several years. I wish I’d kept the source so I could give credit where credit is due because it’s a keeper. I served it for our Before Bible Study supper at church last Wednesday night. Everybody enjoyed it except my rancher who dubbed it “Rabbit Turd Soup”. He has a point about the appearance, but the cumin and cilantro give it a warm taco-y flavor and the heat from the hot peppers and cayenne will take the chill off any cold evening. I’m definitely feeding it to my hunters next fall, probably laced with a few more hot peppers. The white chicken/black bean contrast and assorted peppers give it a festive appearance. You can make it as hot or mild as you like depending on the peppers and amount of cayenne you use. Lots of South of the Border type foods aren’t particularly healthy, but this recipe is gluten free, high fiber and lo-fat to boot! Corn chips, cheese and sour cream lessen the healthy factor, but do punch up the flavor. I made it a second time and added rice to make it thicker. Like most soup, it’s even better reheated. I think it would also be good with beef and beef broth instead of the chicken. Cut way back on the broth, and it would make a good burrito or enchilada filling. Saute onion, celery, peppers in olive oil until softened. Add garlic and hot pepper; cook for 1-2 minutes until fragrant. Add the rest of the ingredients to the pot, bring just to a boil and reduce heat. Simmer slowly for 1/2 -1 hour so spices blend. Stir and check flavor every 10-15 minutes. Adjust spices to taste—after all, a recipe is just rough guide! Stay warm—there’s still plenty of winter left!